French Cahokia, founded in 1699, was not the first French outpost, but it was the earliest settlement that survived more than a few years. Kaskaskia was the next place French settlers built and it was followed by a series of east bank towns at Prairie du Pont and Fort Vincennes on the Wabash River. Settlements by the French on the east bank of the Mississippi included the Village of Nouvelle Chartres & Fort de Chartres and included New Madrid (then known as Ainse de la Graise or "Greasy Bend") and St. Genevieve on the west bank of the Mississippi. These were followed by St. Louis, St. Charles, Carondelet (in 1767), St. Ferdinand (now Florissant) and Portage des Sioux. Settlement increased after the late eighteenth century and the end of the American Revolution. As settlers reached the American Bottom there were those who established homes within the Mississippi River's flood plain, on the eastern shore. At the time, the area was swampy and prone to flooding. Most settlers preferred the higher and better draining Missouri side of the river. We know the identity of only a few of the first Illinois settlers. The historical record begins in detail with the forceful presence of a single man, Captain James Piggott, who, while instrumental to the region's development, certainly benefited from the help of his family and the other settlers of the area. James Piggott took the long view regarding the development of Illinois territory. Born in Connecticut, his fortunes took him further west throughout his life. He served in the Revolutionary War as a member of the Eighth Pennsylvania Regiment. After his military service he joined George Rogers Clark recruiting families to live in the proposed town of Clarksville, close to present day Wickliffe, Kentucky. Chickasaw Native Americans forced the abandonment of this endeavor in 1782 and Piggott moved with seventeen families to Illinois territory. In 1790 Illinois territorial Governor Arthur St. Clair made Piggott a territorial judge. He settled in Cahokia and soon began the business of providing ferry service crossing the Mississippi to the more developed St. Louis side. The ferry operation continued long after Piggott's death in 1799, later being operated by his sons and eventually absorbed into the Wiggins Ferry monopoly. In 1808 Illinois City is established. The towns name changed to Illinoistown in 1817. James Piggott, a late eighteenth century pioneer and a territorial judge for Illinois, settled in the American Bottom region of Illinois after migrating from the Eastern United States. Once settled in Cahokia, Piggott and his family built a log and mud road from that settlement to a point on Cahokia Creek opposite St. Louis in 1792. During that time the area that is present day East St. Louis was swampy and uninhabited. Goods crossing the river from the Illinois side had to travel from Cahokia, upstream to St. Louis. Piggott's road allowed him to move goods onto Cahokia Creek, into the Mississippi, and across the river to St. Louis. 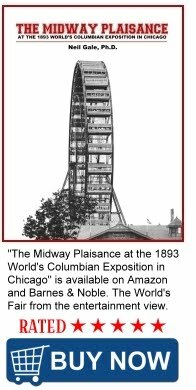 This access was more direct than shipping from Cahokia and Piggott soon had a growing business providing access to St. Louis. Once established Piggott refurbished the route to Cahokia Creek with a sturdy road consisting of rocks buttressed with logs through the swampy region. Cahokia Creek, not wide or deep enough for regular use, quickly became an obstacle to Piggott. He spanned a 150-foot wooden bridge over the creek to the river front where he built two log cabins. Piggott's Ferry became a central point for travelers and soon the area further inland began to be developed. After James Piggott died in 1799, Piggott's Ferry remained in business. The growth of St. Louis in the early nineteenth century encouraged further development of the Illinois side of the Mississippi River through the increased demand for transportation across the river. Soon the Piggott family had a number of neighbors and their business faced competition from other entrepreneurs interested in capturing some of the ferry business. When James Piggott established his ferry service in 1795, the closest settlement on the Illinois bank was south of the ferry in Cahokia. However, Piggott was soon transporting both people and goods to St. Louis and the ferry landing was a natural place for commerce to develop. Between 1805 and 1809 a wealthy French Canadian, Etienne Pinsoneau, purchased land behind the ferry landing and built a two-story brick tavern. He called the area Jacksonville. In subsequent years Pinsoneau sold some of the land and in 1815 Moses Scott built a general store. The McKnight-Brady operation bought out Pinsoneau at the same time it invested in Piggott's ferry. Brady and McKnight platted the land behind the Piggott ferry in 1818 and called it Illinoistown. A traveler in 1821 described the settlement as one consisting of roughly twenty or thirty houses and one hundred inhabitants. In 1819, Samuel Wiggins, a politician and businessman, bought an interest in the Piggott family's ferry operation and began to compete with the McKnight-Brady ferry and other ferry services. 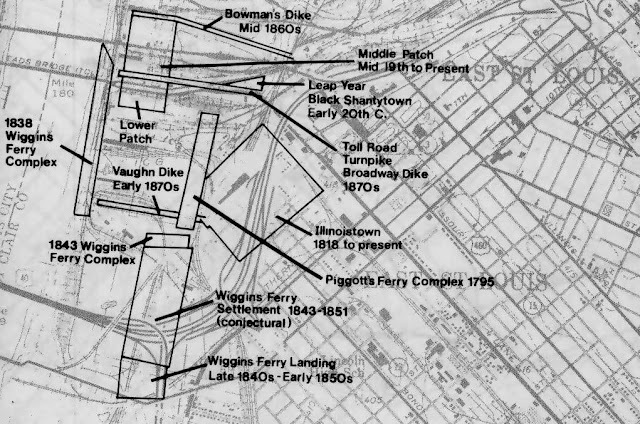 Soon after he began operations Wiggins used his political clout to persuade the Illinois General Assembly to grant him a charter with exclusive rights to two miles of Illinois river front opposite St. Louis and the right to establish a toll road leading to his landing. The act went further and allowed no new ferry operations to be created within a mile on either side of Wiggins' landing. Wiggins later bought out the McNight-Brady interest in Piggott's Ferry. To further his control of the Illinois side of the river he went into partnership with a prominent businessman who owned substantial portions of land in Illinoistown. The Wiggins operation marks a watershed for the area that would become East St. Louis. Through Wiggins' political power in Illinois he established a stronghold on river transportation to St. Louis and the west. This concentration of power was temporary, but lasted long enough to make Illinoistown and later East St. Louis a central crossing point for goods and people heading west. One of the first steamboats to ply the Mississippi stopped at St. Louis and the McKnight-Brady landing in 1817. The new technology promised new economic potential for the Illinois side of the river and Samuel Wiggins capitalized on this future. In the early years of Illinoistown it is clear that Samuel Wiggins, a politician and Illinois businessman, was an influential presence. The Reverend John Mason Peck described the town as a small one of about a dozen families with a post office, hotel, livery, and store. The post office was called Wiggins Ferry and Samuel was the postmaster. Although a flood in 1826 (only one of many to damage the area) may have set back the growth of Illinoistown, Wiggins' concentrated ferry business helped spawn economic growth throughout the 1820s and 1830s. According to a study by the National Park Service, by 1841 Illinoistown had become a bustling place with numerous grocery stores, two bakeries, a clothier, a cooper, blacksmiths, taverns and hotels. There were more than one hundred homes and a newspaper, "The American Bottom Reporter." Samuel Wiggins was apparently not a person to have others do his work. He was involved in the lives of the people living in and around Illinoistown as an excerpt from William Wells Brown's narrative proves. Steamboats brought Illinoistown and St. Louis a variety of new ventures. Steamboats needed fueling stations and a means of transporting their goods once ashore. The local ferry operations were a natural fit, developing shore facilities for steamboats and already possessing the ability to quickly move goods across the river at low cost. 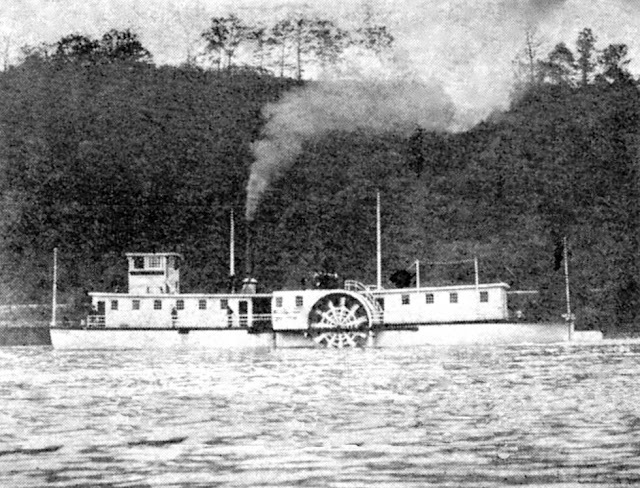 An example of a time-period wood burning steamboat ferry on the Mississippi. By 1828 the Wiggins operation had converted its ferries to steam, taking advantage of its renovated facilities and the fairly low cost of constructing a steamboat. Illinoistown becomes East Saint Louis, Illinois in 1861.